A little background on what’s been happening. I’ve once again changed coasts and moved back to San Diego. With all the excitement of moving, blogging has taken a backseat to life for a bit. To add a little bit of excitement, I’m finishing off my job in Boston while living in San Diego. This means weekly trips coast-to-coast. My green-cred is seriously taking a hit here but I’d like to do the right thing with my job for once. Back to the Daring Cooks…This month we got to make something I’ve been wanting to try out ever since I picked up the awesome cookbook 660 Curries, Indian Dosa. 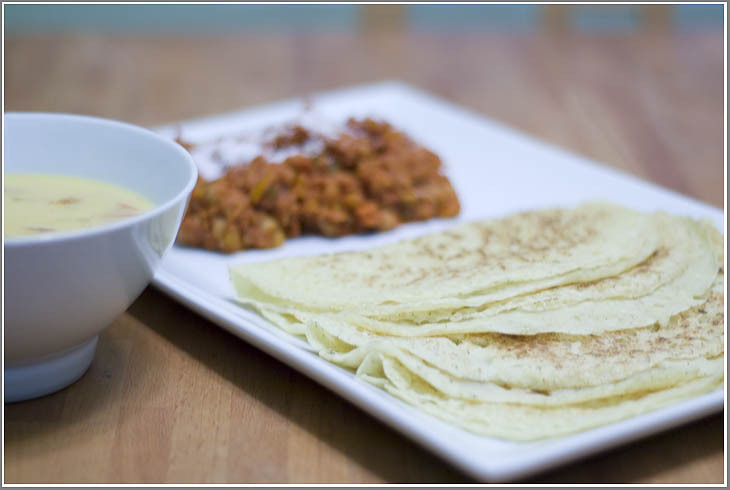 Dosas are like thin, crisp pancakes that are either filled with a yummy curry or used much like naan to pick up yummy bites of curries. We were posed with an additional challenge this month, 100% vegan. No animal products were allowed in this at all; no milk, cheese, meat, or anything from an animal. Luckily there were a few curries to go along with the dosas that were veggie friendly and quite tasty. I didn’t really have all that much time to experiment and just went with what we were given this time around. The dosas were a breeze to make, much like making crepes. It was a nice thin batter than quickly cooked in my crepe pan and wasn’t all that hard to remove. Like making crepes, the first one is always ruined, but I was expecting it. The cooked up very quickly and, once I got in a groove, probably could have made 20-30 of them in no time at all. Once the dosas were done, I served them up with the two curries, both which offered no real surprises in preparation. 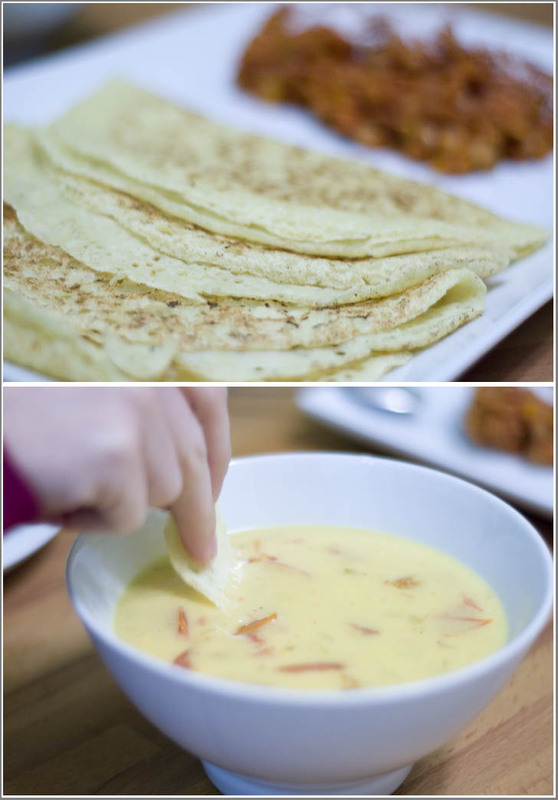 This recipe comes in 3 parts, the dosas, the filling and the sauce. It does take awhile to make, but the filling and sauce can be made ahead and frozen if need be. You can serve them as a main course with rice and veggies, or as an appetizer. This does take a little planning ahead, so make sure you read the recipe through before starting (I forgot & didn’t start making the rice until everything was ready, oops). This filling works great as a rice bowl topping or as a wrap too, so don’t be afraid to make a full batch. I want to see a picture of this crepe maker.